For more than 60 years, Phifer has been at the forefront of manufacturing innovative screening materials suited to a variety of applications. Our sun screen fabrics block harmful UV rays and reduce solar heat gain, making them an excellent choice to use in fixed shades and screening for doors and windows. Learn more about Phifer exterior solar window screen materials and the added benefits they can offer your home. What Are Outdoor Solar Screens? Outdoor solar shade material can be used for either exterior fixed window screen panels or exterior roller shades. Solar screens block harmful UV rays and can help reduce energy costs. Backed by a 10-year warranty, Phifer exterior solar screen products help make your home more comfortable in a variety of ways. If you live in an area with warmer year-round temperatures or have a room with a westward facing window, fixed solar window screens can help deflect the glare and heat from the sun. Even if you don’t live in a warmer climate, Phifer solar screening can offer substantial benefits and sizeable savings on energy costs, preventing solar rays from hiking up temperatures in a room by absorbing and dispersing heat. When fixed exterior sun screens are installed in a window or door, the tightly-woven fabric acts as a barrier between solar rays and your home. The tight weave blocks solar rays from penetrating the glass on doors or windows. Our solar screen products are manufactured to block between 65% and 90% of the sun’s heat and glare. As a result, temperatures stay comfortable without making air conditioning units work harder and increasing utility costs. 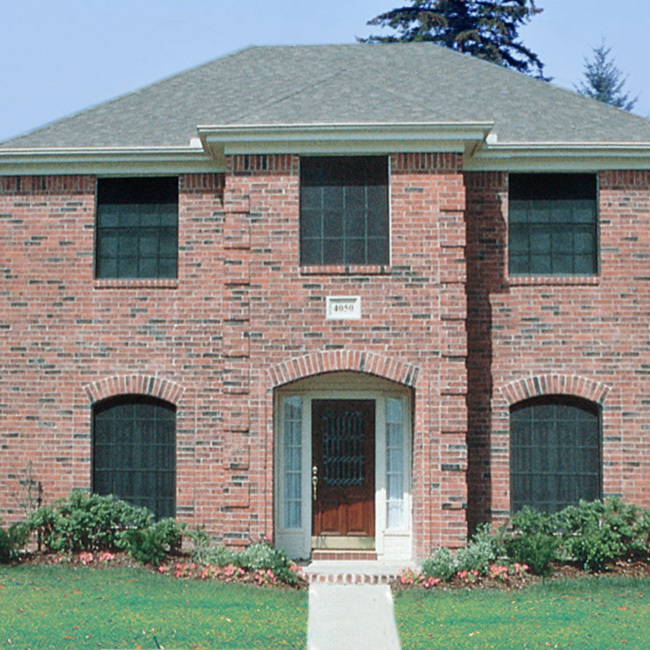 What Are the Added Benefits of Installing Exterior Sun Screens on Your Home? In addition to protecting your home from harmful UV rays, fixed outdoor sun screens deliver a variety of benefits. Discover more about the unique benefits of installing exterior sun screens made from Phifer sun control fabrics. Protection against UV rays - Phifer exterior sun control materials provide protection from harmful ultraviolet rays that can damage or fade flooring and furnishings and increase energy costs. Many Phifer exterior solar screen products have been given the seal of approval from the Melanoma International Foundation for upholding the highest standards of sun safety. Save on energy costs - Engineered to disperse heat from sun rays, installing sun control screening can help save up to 25% on energy and air conditioning costs, making indoor temperatures more comfortable year-round. Reduce glare - Work, read or watch TV without glare causing you to squint. Phifer exterior sun control screening helps reduce solar glare inside your home. Insect protection - Phifer built a reputation upon offering the best and most innovative insect protection screening. 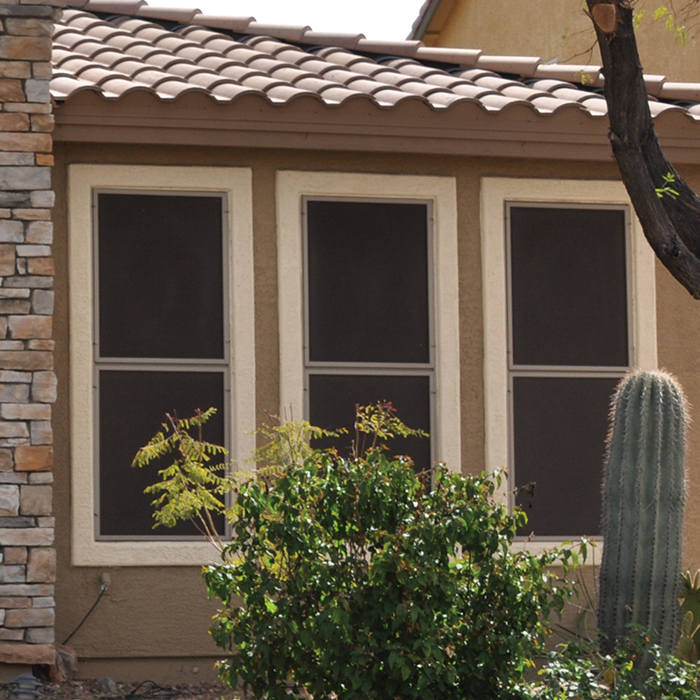 Phifer exterior sun control screening doubles as fenestration screening, keeping bugs outside where they belong. Improved privacy - Our exterior sun control products can be used for panels that help add an extra layer of daytime privacy to your home. Choose from a variety of weaves and colors to build a better barrier against the outside world. 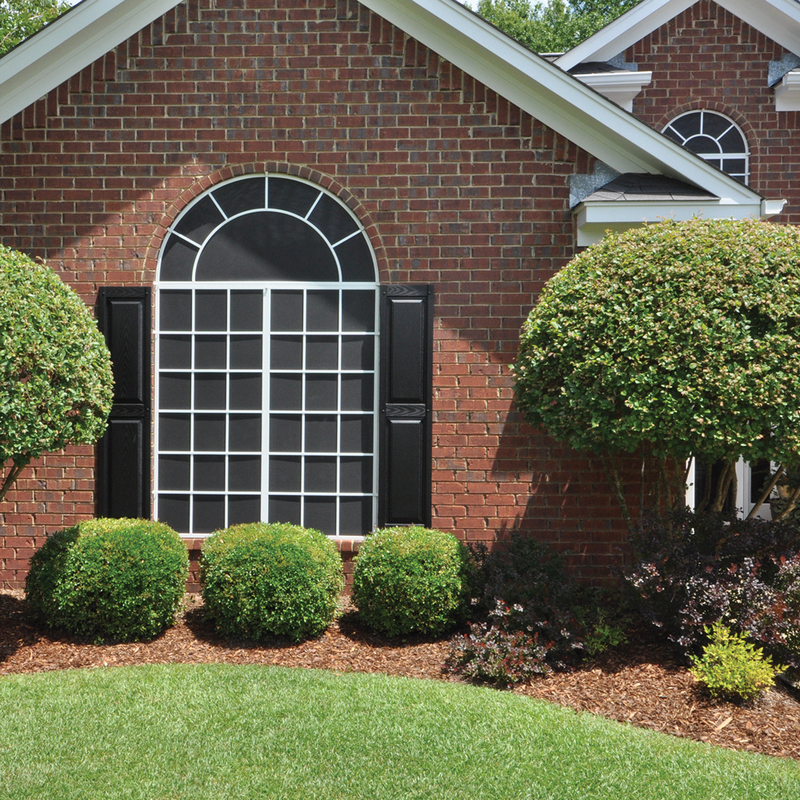 GREENGUARD Certified - All Phifer exterior sun control products are GREENGUARD Certified, offering better in-home air quality and meeting rigorous, worldwide standards for low VOC emissions. Not sure which is the best solar screen material for your needs? Begin your search with some of Phifer’s most popular exterior sun control fabrics that can work for a variety of applications. If you’re not sure which product is best, explore our gallery to find outdoor shading or screening ideas that work for your home. Durable, pet-resistant, and easy-to-clean, SunTex 80/90 blocks between 80% and 90% of solar rays. It works exceptionally well in a number of outdoor applications for doors and windows, and provides excellent protection against pests. Combining a variety of benefits in one superior product, Super Solar Screening+ offers insect protection, excellent outward visibility for a clear view of your surroundings, and the ability to block 90% of UV rays. Made from vinyl-coated fiberglass, Phifer’s Super Solar Screening+ is super strong and backed by a 10-year guarantee. Constructed from durable vinyl-coated fiberglass, Phifer SunScreen blocks 70% of solar rays, keeping temperatures more comfortable inside the home. It also offers protection from insects and pests and is suitable for use in window and porch screening projects. You can find Phifer-made materials for use in sun- blocking screens at both online and brick-and-mortar locations. Contact a friendly Phifer representative who can help you find the right product for your needs and where to purchase your preferred fabric.